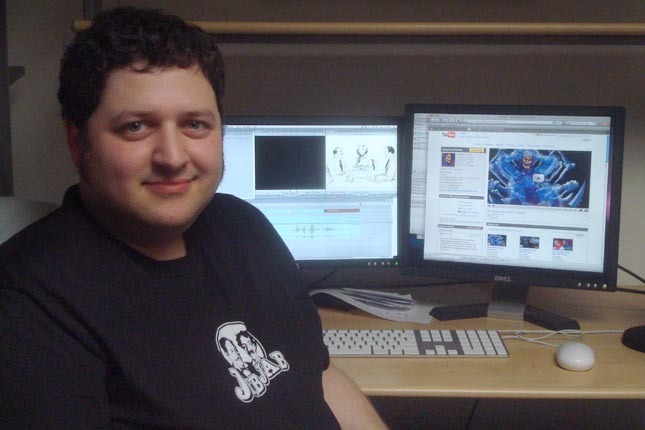 For the past few months we’ve been excited to have Daniel here in house, working his animation and editing voodoo on what we like to call our “shorties”, aka the remixed public domain footage eCards we feature at JibJab.com. Andy, an ingenious writer/producer here at the site, has been overseeing our shorties program since it’s start about a year ago, and of the several artists and editors he has had cranking out shorties over the past year, Daniel brings one of the most unique voices to the site. Daniel boasts credits that range from his work on cartoons for Hanna-Barbara to a series of PBS shorts called Inventoons. For more of his work, including his wildly popular He-Man remixes, check out his various websites and youtube channels, embedded all over this mighty paragraph! Oh yes, and Daniel wanted us to mention, he can probably whoop you good in a game of Boggle. He’s just sayin. This entry was written by paulhanges and posted on March 24, 2009 at 6:10 pm and filed under Uncategorized. Bookmark the permalink. Follow any comments here with the RSS feed for this post. Post a comment or leave a trackback: Trackback URL. OK, you’re on for the Boggle game. My computer or yours?